Scottish engineering firm Hydro Group is bolstering Britain’s defences amid growing demand for its services in military markets around the world. The Aberdeen company is part of the supply chain behind the UK’s seven-strong fleet of Astute-class, nuclear-powered hunter-killer submarines, some of which are still under construction. Hydro Group managing director Doug Whyte said the new Dreadnought-class submarines, which will carry the UK’s Trident nuclear weapons after they replace the four-strong Vanguard fleet from the 2030s onwards, were “the next big thing for us”. 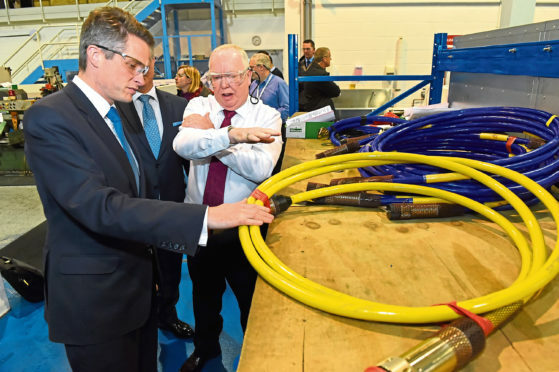 He was speaking during a visit to the company’s Bridge of Don headquarters by Defence Minister Gavin Williamson and north-east MP Colin Clark. Hydro Group employs more than 100 people in the design and manufacturer of underwater cables and connectors for subsea, underwater, topside and onshore applications. For many people in the north-east, the firm is best known for its services to the North Sea oil and gas industry. Mr Williamson and Mr Clark discovered the proportion of revenue generated from defence-related business is “now at 60% and growing”. Mr Whyte said the company was supplying engineered products to navies globally, with the UK, Taiwan, South Korea and Australia among the target areas on its radar. Projects like Dreadnought, on which the UK Government is spending at least £31 billion, can be a “lever” for Hydro Group winning other work around the world, he added. Mr Williamson said the Ministry of Defence spent more than £1.6bn a year on the Scottish supply chain, protecting in excess of 10,000 private sector jobs. Mr Clark, MP for Gordon, said Hydro Group was another example of north-east innovation.